The Model One and Model Two (an updated version of the Model One) are the two processors capable of creating HDCD files. They are also high end professional A-D and D-A converters. In fact even to this day (mid-2009), the Model Two is still considered to be the absolute pinnacle of A-D conversion—as it is the finest, most accurate, and best sounding A-D converter ever made. 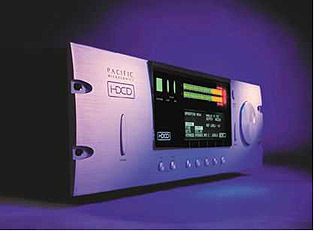 The Model One HDCD processor, manufactured by Pacific Microsonics, was the original HDCD processor. When it was introduced, at the time it was the state-of-the-art in 44.1 and 88.2kHz A-D conversion. Setup and operation of the Model Two are controlled by a backlit graphic display, rotary optical encoder, and software-configured switches. Multiple operating configurations can be stored as user-labeled presets, allowing instant setup. Signal-level metering is provided by a sophisticated multifunction, four-color LED bar graph. Model Two software updates can be downloaded easily using a built-in RS232 serial data port. All other levels are set using digital attenuation in 0.188-dB steps at 44.1 and 48 kHz (displayed level selection is shown in .1-dB steps for a possible indication error of ±0.094 dB). At 88.2 kHz and above, digital attenuation is in exact 0.1-dB steps. Output 1 and 2 word lengths may be independently set at 44.1 and 48 kHz. The Model Two has isolated high-impedance bridging word clock inputs and requires an external 75 Ω termination. This allows multiple units to be "daisy chained" for synchronous operation with the last unit in the chain terminated by 75 Ω. The 75 Ω word clock output is AC coupled to prevent ground loops and can be connected to most equipment with CMOS TTL-compatible 75 Ω word clock inputs. Backlit, dot-matrix graphic display, rotary optical encoder, and software-configured switches allow software-based configuration of all setup and operating parameters. Multiple operating configurations can be stored as user-labeled presets, allowing instant setup. Two-channel, 66-dB range, four-color LED bar graph. "Peak" and "Over" indication selectable for duration and sensitivity, reference level variable from -6 dB to -21 dB in 1-dB steps, reference level set mode (provides .2 dB per segment resolution), calibrated digital signal word length display mode, 6-dB HDCD 16-bit "Peak Extend" level indication, display reset, and variable brightness. Peak bar or simultaneous average bar with peak dot display modes. Eight Motorola 56009 DSPs and one Pacific Microsonics PMD-100 HDCD decoder ASIC control A/D conversion, sampling rate conversion, word length conversion, digital gain adjustment, HDCD encoding and decoding, and D/A conversion. Enclosure is 17" wide (432mm) behind front panel. For more information on the Pacific Microsonics Model Two click here.